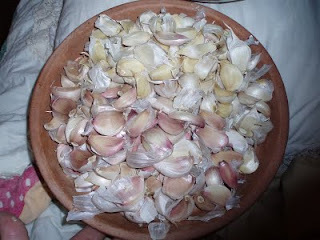 I got the garden tilled Friday, then planted some shallots. Saturday I got the garlic in the ground, the Texas White I got at work. It was weird though ~ Even though it was supposed to be the same type, there were some bulbs that were white and some that had a pink/purple blush on the cloves. I separated them in the dish and you can see in the picture what I mean. There was only one bulb that was a kind of hybrid between the two ~ cloves around the outside had a very light purple blush and the ones in the middle didn't. Now that it's done, I'm really glad it's in the ground. I need to get some turkey compost to top it with. And pine needle mulch for the walkways in the entire garden. It'll be so nice to work out there then.